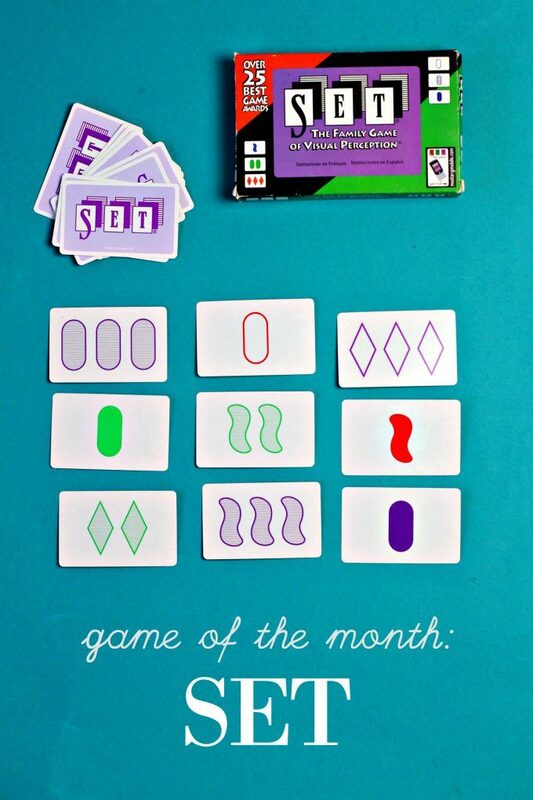 My family loves simple games that are adaptable for a number of different situations. 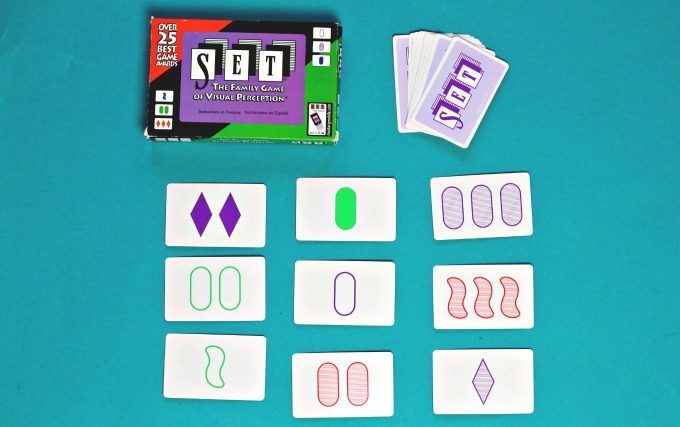 SET is an easy-to-learn card game that can be played together as a family, or individually as a brain teaser. You can play it as long as you want or play it for just a few minutes as a quick boredom buster instead of scrolling through Facebook. The award-winning SET card game was created by the same company that created Quiddler, which I featured previously in my game of the month series. 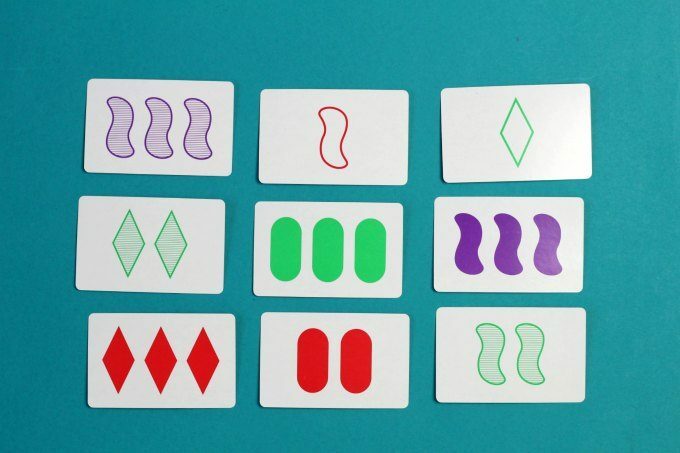 It is a brain-busting card game that boosts all kinds of skills! Visual tracking, logical thinking, patience, spatial perception skills are all hard at work in your kids’ brains (and yours, too!) when they are playing SET. In fact, I love SET for kids so much that I put it on my list of our favorite single player logic games. As a family game, SET is a game of speed. Twelve cards are dealt in a 3 by 4 array. Please ignore the fact that I inadvertently photographed a 3 by 3 array instead! Perhaps I should increase my caffeine consumption. Players race to find a set of three cards which share certain characteristics. Each card displays a design that has four elements: shape, quantity, color and shading. For three cards to make a set each feature on the three cards must be all the same or all different. For example in the photo below, the green empty diamond, the striped green squiggles and the solid green ovals make up a set because: the color is all the same: the quantities are all different, the shadings are all different and the shapes are all different. Players races to find as many sets as they can. He calls out “SET!” and picks up the three qualifying cards. When a set is removed from play, it is replaced with new cards, thus moving the game forward until the deck is used up, or the players call it quits. There are rules for collecting points, if you like your game play to be as competitive as possible. If played solo, SET loses the speed element, but the game is just as entertaining. A player sets up the twelve cards and finds sets on his own. He can play until he runs out of steam! As I said above, playing SET supports a whole host of skills important for academic achievement and critical thinking. Logical and spacial reasoning, seeing patterns are important for math and science learning. Visual perception boosts literacy and artistic discernment and patience is a skill kids can always use more of! If your child has trouble with the speed element, or if younger children can’t keep up, take turns finding a set. I recommend the game for ages 6 and up, but 6 year olds will most likely need help and/or more time than others. Set is an excellent travel game to have on hand during family trips. We’ve been known to play at the dinner table. But I recommend ditching the speed element if food is involved! We never play for points. Instead we play this as more of a cooperative game since each of our family members has very different visual perception skills. Note: I first discovered SET years ago online in the New York Times. I didn’t realize then that it was also a physical card game. I now much prefer the experience of playing without staring at a tiny screen! « Picture Books about Snow: Celebrate Winter! We play games and draw with crayons every night at the dinner table (an absolute must for keeping a child with severe ADHD at the table). And we adore SET, but find it takes up a lot of room on the table (however, I love your idea of taking turns to accommodate various skill levels… I also offer a 15 card layout for my sons). Our fave dinner table games are Master Mind and Uno! We do UNO, too and Master Mind is a good one. I like your idea of drawing — like at a restaurant!